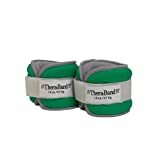 What Are The Best Ankle Weights To Buy In 2019? In this article, we review 5 the best ankle weights you can buy today. We also dive into more detail on what options are out there, what you should look for and some of the typical uses for ankle weights. Historically ankle weights were popular with many sports professionals and especially basketball players looking to increase their vertical jump. Today however they are seen as a perfect way to get fit whilst doing everyday chores around the house, whilst out walking and are a great addition to your workout routine. Ankle weights typically come in 5 or 6 different weights and should be selected depending on the intended uses and your current physical condition. This is where we typically start with ankle weights, 1 lb and 2 lb weights are one of the lightest you can buy and are great for use around the house and for walking and even running. Next, up we have the 5 lb ankle weights. These are also suited to walking, jogging and running and will provide a greater resistance which will aid your training. This is where we start to step it up. 10 lb ankle weights are more suited to those doing static exercises, so that excludes running and walking. Obviously, if you are an experienced runner and are already fit then these 10 lb weights will work for your routine. 20 lb weights for the ankle are most often saved for the gym or your home gym, whilst performing exercises that require you to lift yourself and your bodyweight. At 20 pounds, you will feel the extra weight as you train and your muscle will get stronger because of it. 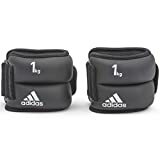 These are extremely heavy ankle weights and are used mainly to increase a person's body weight when doing Calisthenics or bodyweight exercises. Things such as weighted dips, pull-ups, and leg raise. There are a few extra features and options when it comes to choosing the best ankle weights. First up, we have ankle weights that use water instead of a solid inner. This type of ankle weight is perfect if you are looking for a product that's flexible and adjustable. You can change the amount of weight each ankle has by adding or removing water from the inside. Another benefit to water ankle weights is that they are comfortable as there is very minimal hard surface area to press against your skin. It can save you money as you don't need to by various ankle weight sizes. You can adjust the weight to the desired level for you and can work around the manufacturer's set weights. Being adjustable, they can also be used for write weights too. Running is hugely popular and has been growing in popularity for the past few years, both road and off-road running is now a mainstream sport. Plus with events and marathons being organized in most big cities and even smaller towns, there is no shortage of chances to push yourself. By using ankle weights as part of your running routine, you can become stronger and quicker which will help for competition races should that be your thing. Just be sure not to go too heavy too soon, as you risk injury especially if running on uneven ground. n.b – some experts suggest that running with ankle weights can cause injury, which is why you should research the correct techniques and look for alternatives, such as exercise in water combined with ankle weights, which reduced the stressed placed on your joints. It's not only running with ankle weights that can provide benefits to the body, they are also suited to walking. Even if that means around the house, around the block, up and down the stairs, on a small elliptical machine or to pick the kids up from school. Whatever walking you do, by adding ankle weights you can get an extra workout without the effort of going to the gym and spending hundreds of dollars per year on equipment. Think about it, walking is something you already have to do, so why not get extra benefits out of it. As I mentioned at the start of this article, a great way to improve your vertical jump if you are a basketball player is to use ankle weights. Weighted jumping, “rim tips” (where you jump lots of times to touch the hoop), and using weights during training sessions will add that extra difficulty that your legs and body needs to increase performance. Weighted vests are another option if you are looking for something heavier. Another very popular use for ankle weights is for boxing, and more specifically improving foot speed and endurance. A boxer needs to be light and quick on his feet and what better way to train that to INCREASE the weight he/she has to move around. When you remove them for a fight, your body will have already gotten used to the heavier weight and will feel light as a feather! As mentioned earlier, these are many benefits to using ankle weights. As they are a form of resistance training, they place greater strain on the body whilst performing even the simplest of movements. This, as you know, is what causes the body to get both fitter and stronger. Great for ab workouts – I for one hate doing sit up, instead I perform hanging and even lay down leg raises. They don't hurt your back and combined with ankle weights are a great way to help with the goal of 6 pack abs! Non-invasive and cheap – this piece of equipment is one of the cheapest ways I know to get a workout whilst not even knowing it. After a while, you will forget they are there and carry on about your business happily. 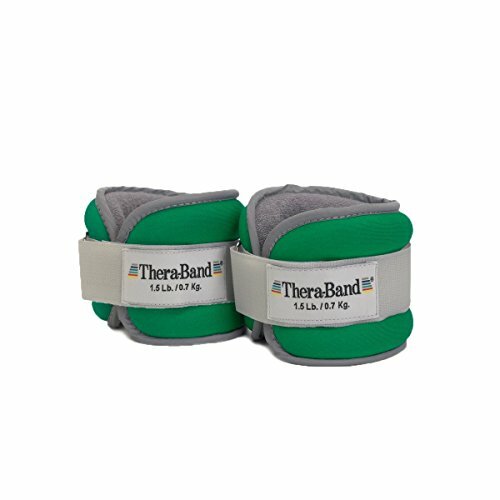 The Thera-band comfort fit set is designed to be used as both wrist and ankle weights. They come in 3 different weights, 2lb, 3lb and 6lb and a range of colors. They have a neoprene outer and a soft terry cotton fabric for the part that touches your skin for improved comfort. They are also adjustable to provide a snug and secure fit, whatever the activity. My favorite feature of the Thera-bands however is the reflective trim they have for improved visibility and safety from motor vehicles, especially useful at night. The Da Vinci ankle weights offer a greater range of weight options than the Thera-band, they come in 5 sizes, 1lb, 1.5lb, 2lb, 3lb, and 5lb. Users have noted how soft and comfortable the Da Vinci weights are to wear. Despite their 80's appearance, the All-Pro, are perhaps one of our favorite sets of ankle weights. This is primarily due to the ability to adjust the weight you carry. This model utilizes simple metal rod weights that slot into the fabric, allowing you to increase or decrease the weight as desired. This is great as you only need one set of ankle weights and you get many different possible uses from them. The weight is adjustable in 1/4-lb increments up to 2.5 lbs per ankle. The Nayoya ankle weights are bets suited to light exercise, home use, and walking. They come in a set of 2 which weight 1.5 lbs each and pack away neatly into their own small carry case. 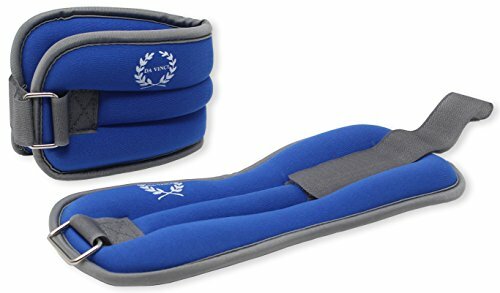 These ankle weights are less bulky than the others featured and are a great option if you are looking to wear them under trousers etc. 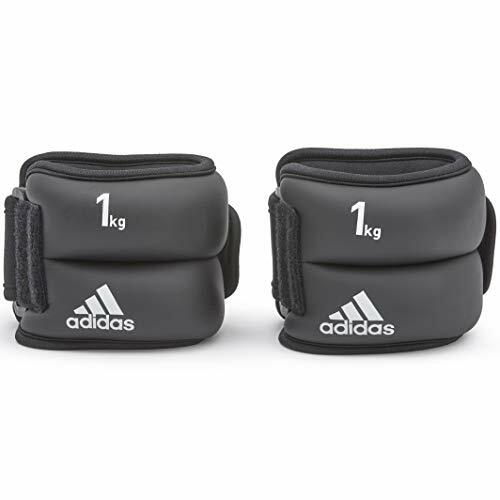 These Adidas ankle and wrist weights are another great option if you are looking for something you can adjust. Each weight has 4 sections which contain weighted bars that can be removed or added to as needed. They have a super strong velcro grip that locks in securely and they come from very well known brand, so you know that quality you are getting. Now that you've seen the best 5 ankle weight sets on the market, it's time to decide. The important thing to keep in mind before making your decision is to know what you will be using them for and if you need them to be adjustable so you can increase or decrease the weight as needed. What weights should I use when starting out? If you are just getting started with ankle weights, it is important that you don’t jump straight into the heaviest, most challenging weights – you’ll need to work up to those over time. Instead, you’ll want to start out with a relatively light weight just so you can get used to the way that ankle weights feel during your workouts. Ankle weights challenge you to use your core and your leg muscles in a different way than you would if you were just working out without them. Generally, it is best to start off with ankle weights that are two pounds or less. Be sure that they are adjustable to fit your frame for the best results – if they are too large or not snug enough, they will feel even heavier than they actually are. For the first few workouts with the ankle weights, keep the exercises simple so you can get used to the way they feel on your body. Over time, you should slowly increase your ankle weights until you get to a heavier weight that you feel satisfied with. Many brands make light ankle weights or even sell them in sets to cater to beginners. What should I be careful with when using ankle weights? There are many things to be aware of when using ankle weights to make sure that you get the best possible workout and to prevent injury. The most important thing to be careful of is how you are doing your workouts. It is very important to use the correct form when working out, because doing exercises incorrectly can strain muscles and cause pain and injury. These problems are exacerbated with the use of ankle weights. It may be tempting to ‘cheat’ and do your exercises incorrectly when using ankle weights. However, it is better to just push through the challenge while using correct form instead of cheating to make the exercise feel easier. If you have to, you can always do fewer reps than usual until you get used to the ankle weights. Another important thing to be careful of is the fit of the ankle weights. They should fit snugly around your ankle and be proportioned correctly for your size. Ankle weights come in various different sizes and weights to suit different people. If you use a weight that is too large or too heavy for you, it could result in injury or stress on your muscles and joints. It’s also important that they don’t move or slide around on your ankle as you are moving. This can cause irritation to your skin and also causes stress on your ankles, because the pressure on the joint is constantly moving around. If you can, it is often helpful to try on the ankle weights at an athletic store before making a purchase. What to look for in an ankle weight? There are plenty of things you should look for when buying a set of ankle weights. Ankle weights can make a huge difference in your workout routine, but it is important to get a pair that really work to get the best results. Something that is very important to look for are weights that are padded and that use fabrics that won’t irritate the skin as you work out. Weights can feel extremely uncomfortable on the ankles if they aren’t padded, because the angles can dig into your skin at awkward angles. It’s also very important that the fabric is breathable and comfortable on the skin. Many ankle weights have itchy fabrics and velcros that can be extremely uncomfortable as you move around. A good fabric will absorb sweat and feel breathable even during the most intense workouts. 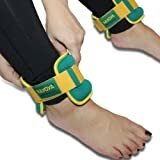 It also helps to have ankle weights that are adjustable in nature, so that you can add and take away weight depending on the types of workouts that you are doing or your level of soreness. Many ankle weights come with a variety of different attachments so you can change their size and weight accordingly. Even if you can’t add and take away weight from the product, it’s still important that the fit is adjustable so that the weights fit snugly on the ankle. This prevents them from moving around. The final thing to consider is the actual size and shape of the ankle weights. Some pack more weight into a smaller size than others do. Depending on the size of your workout shoes and the type of workout clothes that you wear, you may want a certain size that will work comfortably with what you like to wear. 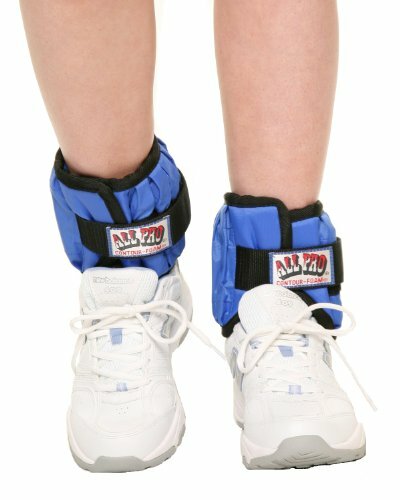 How do I find the right size of ankle weights? It’s very important that you use the right size of ankle weights when working out. Ankle weights come in a variety of different sizes to match your proportions and your muscular ability. If you are on the smaller size or are just starting off with ankle weights, it is important to start off with small ones just to get used to the way they feel. Most brands offer sizes as small as one pound. You should be able to adjust the way the weight fits around your ankle using straps or velcro. When purchasing ankle weights, check to see what measurements they comfortably support. This is particularly important if your ankles are very thin or very thick, as the weights should fit snugly enough that they don’t move around at all, but not so tight that they squeeze your muscles and joints uncomfortably. If your ankle weights come with additional increments to make them heavier, check to see what you can do to make them fit snugly and comfortably as you add or take away weight to them. You don’t want your weights to be too bulky or they will be extremely uncomfortable as you move around. When in doubt, go to your local sports store to try some ankle weights on and see how they feel. This will give you a good idea of how they should feel. What are the biggest benefits of using ankle weights? There are tons of benefits to using ankle weights. They are a great investment for anyone who want to increase their strength and make their workouts more efficient. The biggest benefit is that they help to tone your legs as you walk, run, or play sports. You can also use them to strengthen your core as you do Pilates or other types of abdominal workouts (such as leg lifts, for example). Ankle weights also help you build more strength in a shorter period of time by challenging your muscles to work harder. By making your workout more difficult, you don’t have to spend as much time on it. For example, if you normally do 20 reps of leg lifts in your workout, you can get the same results by doing 10 reps with ankle weights, thus cutting your workout time in half. If you spend a lot of time walking in your daily life, you can also just wear your ankle weights during the day as you go about your business, and you’ll build tons of strength. This increased challenge in your workout is hugely important for helping your tone up and lose weight more quickly than you otherwise might do without the weights. It is very important, however, that you don’t wear your ankle weights too much as you could end up putting undue stress on your joints. Wearing ankle weights in short increments is all you need to make a huge difference in your workout routine.